WEST LAFAYETTE, Ind. — No woman's breast tissue is the same, so MRIs detecting and monitoring cancer shouldn't treat them all the same. Without a way to prove that a new MRI technique is safe for all women, clinical MRIs haven't been able to keep pace with the latest advances in MRI research. More informative cancer detection is possible with stronger magnetic fields that also, unfortunately, increase the risk of tissue heating during a screening. Purdue University researchers have simulated how over 20 different breast tissue ratios respond to heat given off by MRIs at higher field strengths than available in hospitals today. The simulations would allow cutting-edge MRI techniques to finally show that they meet safety limits, as defined by entities like the U.S. Food and Drug Administration, and start clinical trials for real-life use. On the flip side, using knowledge about how much radiofrequency energy each breast tissue ratio can handle, new techniques could one day target the heat produced from an MRI at tumors to kill them. Published findings are featured in the journal Magnetic Resonance in Medicine, and software code for the simulations is available open-access to the scientific community via Github. The work aligns with Purdue's giant leaps celebration, acknowledging the university's global advancements made in health, space, artificial intelligence and sustainability as part of Purdue's 150th anniversary. Those are the four themes of the yearlong celebration's Ideas Festival, designed to showcase Purdue as an intellectual center solving real-world issues. Despite the limitations of clinical field strengths, a yearly MRI screening is still recommended for women with higher than average risk of breast cancer because it's more sensitive than a standard mammogram. "We're starting to develop techniques at high field strengths that could immediately monitor how tumors respond to treatment. So we don't want tissue heating concerns to stand in the way of improving such a powerful tool," said Joseph Rispoli, Purdue assistant professor of biomedical engineering and electrical and computer engineering. How dense a woman's breast is determines how much radiofrequency energy from an MRI the breast will absorb in the form of heat, defined as the specific absorption rate (SAR). The more fibroglandular tissue in the breast compared with fat tissue, the higher the breast density and SAR. But not all women have the same ratio of fibroglandular to fat tissue. This makes it harder for researchers to show that a potentially life-saving MRI technique is safe for every woman, even though the risk of overheated tissue is generally low. "In hospitals, MRI field strengths are currently up to 3 tesla, tesla being the unit we use for measuring magnetic field strength," Rispoli said. "Many techniques would be far superior at 7 tesla. This would come at a fivefold increase in SAR, but also double the MRI sensitivity." The researchers demonstrated through their simulations that a fivefold increase could still stay within FDA limits for most breast tissue ratios, even at 7 tesla. To make these simulations, the team had to jump several public health hurdles, the first being that there are far fewer computer models, or "phantoms," of the female body than the male body. Researchers can test their techniques on computational phantoms, typically generated from MRI or CT image sets, before the techniques are clinically approved for using on real humans. Japan's National Institute of Information and Communications Technology, for example, developed the "Hanako" model to represent the average Japanese woman, and the Swiss Foundation for Research on Information Technologies in Society developed "Ella" for a typical Caucasian woman. Other existing phantoms lie behind a paywall; all were developed in a standing or upward position even though a woman would be lying downward for an MRI, and none have been successfully combined with breast phantoms to accurately predict SAR. Purdue researchers fused 36 breast phantoms at various densities, as classified by the American College of Radiology Breast Imaging Reporting and Data System Atlas, with the full body Hanako and Ella models. They then simulated the behavior of each fused phantom in response to MRI coils at 7 tesla. The simulations help other researchers to tailor their techniques to each woman's unique breast tissue ratio. Power should be limited somewhat, for example, for those with more fibroglandular tissue. "We want to facilitate the most cutting-edge of breast MRI techniques at any site in the world," Rispoli said. "Ultimately, a woman will be able to go in, have a fast low-power anatomical MRI scan, and then the computer could quickly simulate on-the-fly what the SAR would be in that patient." Rispoli is part of a working group with the International Society for Magnetic Resonance in Medicine that will use the simulations to inform best practices for safety testing of experimental radiofrequency hardware. The effort will also facilitate these investigations across hospitals and research sites. This research was supported in part by the National Institute of Biomedical Imaging and Bioengineering of the National Institutes of Health through grant R03EB026231. Purpose: To facilitate assessment of RF power deposition and temperature rise within the breast, we present a method to seamlessly join heterogeneous breast models with standard whole-body models and demonstrate simulations at 7 T.
Methods: Finite-difference time-domain electromagnetic and bioheat simulations are performed to analyze specific absorption rate (SAR) and temperature rise distributions in 36 Breast Imaging Reporting and Data System (BI?RADS) categorized breast models fused to two female whole-body models while transmitting from a 7T breast volume coil. The breast models are uncompressed in the prone position and feature heterogeneous tissue contents; fusion with human models uses affine transformation and the level-set method. Results: The fusion method produces a continuous transient from the chest region to the posterior portion of breast models while preserving the original volume and shape of breast models. Simulation results of both Ella and Hanako models indicate the maximum local SAR, partial body SAR, and local tissue temperature rise are positively correlated with both breast density and the highest BI-RADS density classification. Additionally, maximum local tissue temperature rise is positively correlated with maximum 10-g SAR values. Conclusion: Fibroglandular tissue content plays an important role in the distribution of SAR and temperature rise within breast tissue. 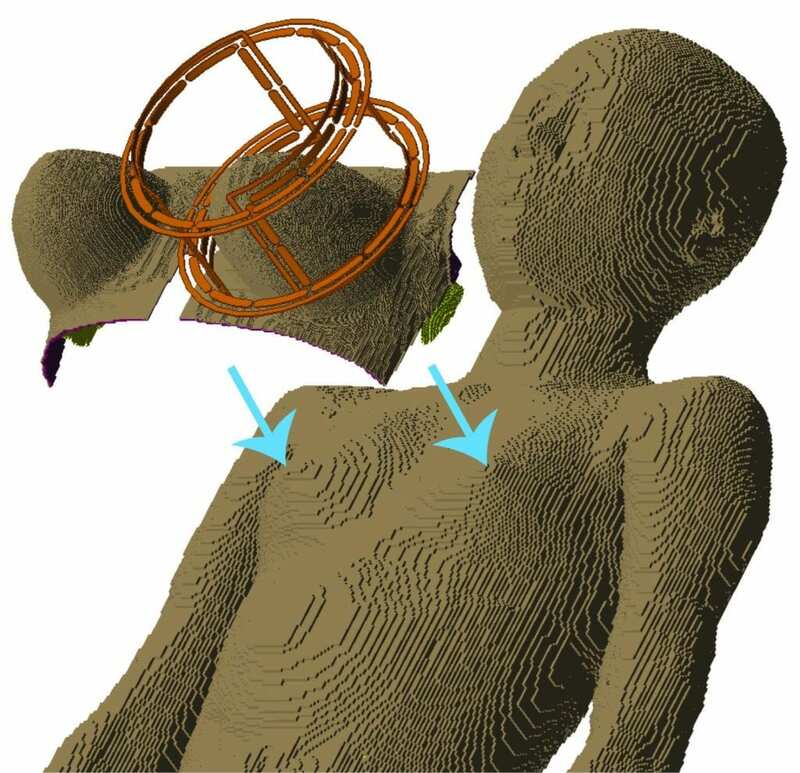 The combined body-breast models preserve the integrity of breast models while concurrently exhibiting the loading of whole-body human models. The procedures presented in this simulation study facilitate safety assessments for breast MRI across the population at both clinical and ultrahigh field strengths.